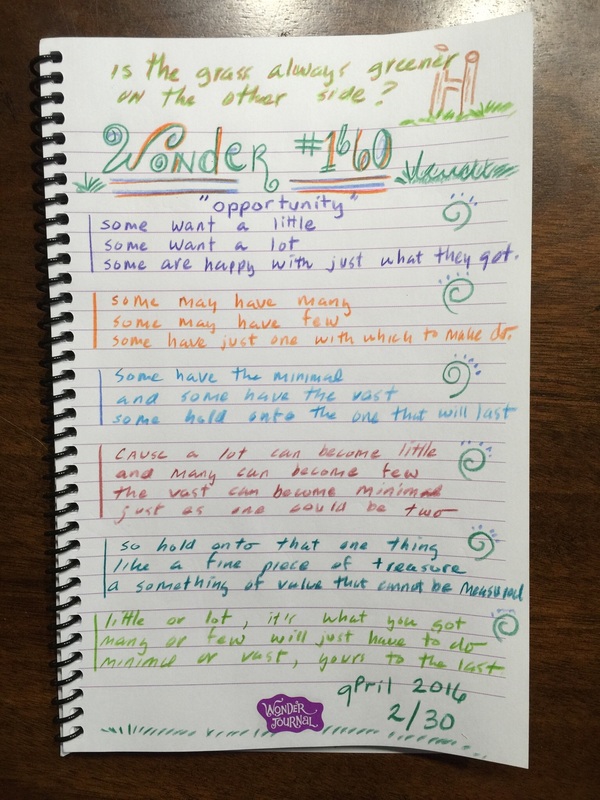 Wonder Poem 2/30: "Is the Grass Always Greener on the Other Side?" Today is Day 2 of the "Wallow in Wonder" Poetry Project with Amy Ludwig VanDerwater. I hope that you following her poems that she is writing at The Poem Farm. 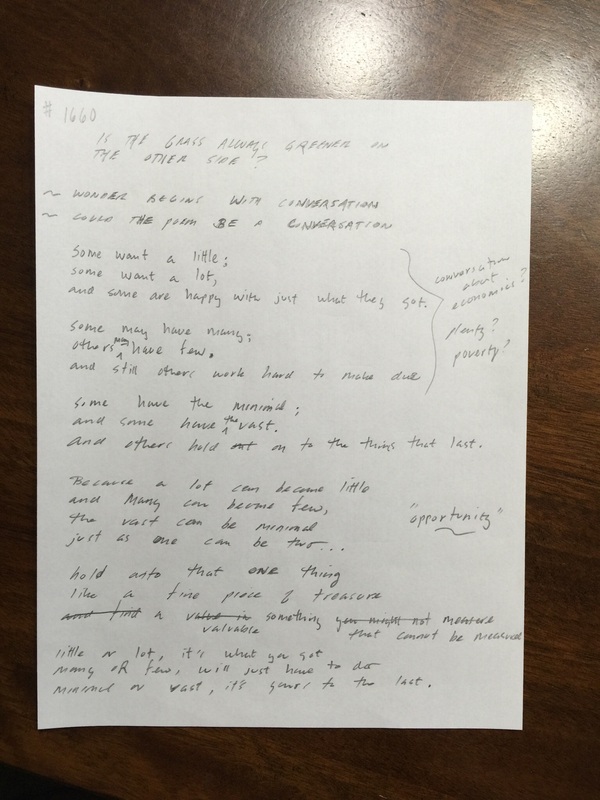 Here is a link to her poem based upon Wonder #1660: "Is the Grass Always Greener on the Other Side?" Yesterday's wonder introduced some wonders for me by way of poetic extension, in particular, how a conceptual or philosophical "wonder" might invite a younger writer in a poetic response. Could the tone or mood of a wonder guide the student response and how that response might emulate, echo, or extend the idea beyond the text offered by the wonder? Could this wonder be an "opportunity" to explore other aphorisms? (Texts like Heavens to Betsy or A Hog on Ice would work nicely here as would the internet for finding familiar and not-so-familiar phrases). Would polling the room (Kylene Beers says "The smartest voice IN the room IS the room.") invite some residential expertise as students might share out classroom-appropriate phrases that might be a part of their experiences. A Side Note: VisualEyes Game is a dice game wherein players work in slow or fast play to create familiar idioms based upon the images that come up upon the dice when rolled. This is a great way to build in a fun activity with a bend toward assessing student familiarity with expressions and idioms. On a cross-content level, could this wonder be an "opportunity" to explore: Socio-Economics? Plenty? Poverty? As it took me a little more "incubation time" with this piece, could we look again at the importance of inviting students to enter into what Donald Graves would call "a constant state of composition?" Since I had the "wonder" on Thursday morning, it gave me all day Friday to really think about what the phrase was suggesting and how I might respond to it with a poem. The intent of these posts and poems this month are to keep us wondering about how the Daily "Wonders" not only lead us to invite students to think about poetic response. A secondary intent might be to keep us all wondering about those classroom "touches" that we know--as teachers--we must continue to be thinking about (classroom/content/curricular connection and formative assessment would be two "touches"). To wrap up today's post, here is my poem inspired by Wonder #1660: "Is the Grass Always Greener on the Other Side?" Wallow in Wonder Poem 3: Wonder #779"Why Do Some People Chase Storms?" What if kids ask the questions?